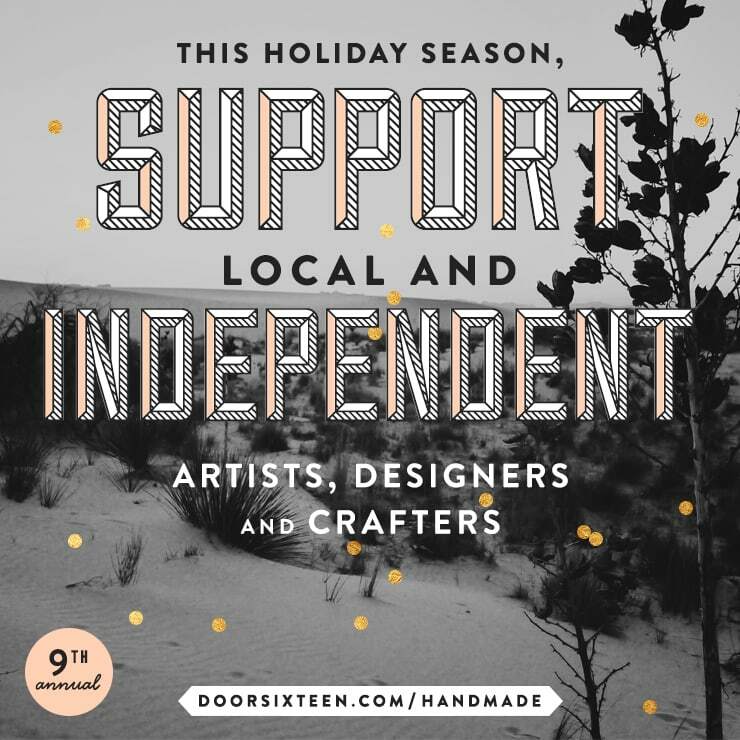 For the 9th year running, I have made a personal commitment to buy gifts for my friends and family from local and independent artists, designers and crafters this holiday season. As I have done in previous years, I’d like to invite independent hand-makers to post links to their shops in the comments. Please refer to the guidelines below before sharing your link. Thank you! ✚ Handmade, sustainably sourced tote bags. Everything is made in America with good intentions and creativity. ✚ Now through December 4th, there is a 20% site wide sale and you can qualify for free shipping with the code FREESHIP at checkout. Thank you for supporting the small makers out there! ✚ Dog collars, bow ties, leads handmade in Chicago. ✚ Small-batch, all-natural vegan soaps with beautiful, modern packing (designed by Anna!). Limited-edition holiday varieties include fir needle, frankincense & myrrh, gingerbread, and charcoal Krampus soap. ✚ Sennit + Sauvage is home to a curated collection of leather goods, hand dyed textiles for wear and decor as well as jewelry and ephemera. Created by hand in St. Louis, MO, all pieces are either one-of-a-kind or limited edition. ✚ Use code DOOR16 for 20% off any order including custom requests through Jan 1st. Thanks Anna! This is always so fun! Oh! The coupon code is valid until the end of 2015! ✚ One of a kind, modern quilts handmade in Seattle. ✚ Original paintings + Prints, Stickers and Buttons featuring original artwork inspired by David Bowie, Wednesday Addams and more! ✚ illustrated prints, tote bags, patches, t-shirts and postcards of illustrated women in history. ✚ All natural & organic small-batch grooming products for the guys. ✚ Use code “THANKS15” for 35% off your entire purchase, now through Cyber Monday. ✚ Use code “HOLIDAY15” for 40% off your entire purchase, now through Cyber Monday. ✚ Architect designed 3d printed jewelry. ✚ Crystals & Runes. Talismans & Amulets. Portable magick, entirely handmade in Paris with ethically sourced, recycled sterling silver and fine handpicked crystals. Each piece is unique. Valid until Monday Nov. 30, 23.59 Paris Time. ✚ Odd Daughter Paper Co.
✚ stationery (greeting cards, art prints, etc.) – mostly letterpress! ✚ 25% off + free shipping until 11/30 with code GOODKARMA. 10% of the sales will be donated to the Chicago Women’s Health Center as part of the Good Karma Sale movement. ✚ A small selection of illustrated ceramics. ✚ Enter DOOR16 at check-out to get 16% off all orders worth over US$30/CA$40, until 16 December 2015. ✚ one-of-a-kind furniture and decorative objects for the home with a focus on traditional woodworking techniques and inlay. ✚ I sell WordPress themes and other digital goodies, I also do custom work too. ✚ 10% with the code holiday until the new year. ✚ Scandinavian style Christmas ornaments and other small gifts. ✚ I turn your kids drawings into real dolls. You send me the drawing and i send it back as a plush doll. ✚ Free: Gold Midi Plain Ring with a minimum $50 purchase. Mention “DOOR16” in the notes when checking out. ✚ Hand-lettered products to make bibliophiles happy. 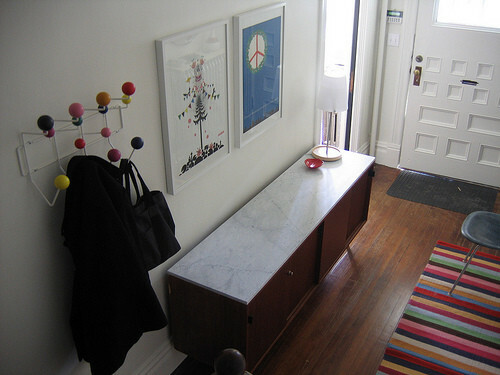 ✚ We are a small etsy shop selling beautiful vintage homegoods. ✚ All of my products start as a basic pencil drawings and transform into cheeky cards, totes, prints, decals and glassware! ✚ Moon Calendars and my illustrations mainly as posters. ✚ Save 10% off until 1-1-16 using the code: DOOR16. ✚ Art inspired leather bags made in Seattle. ✚ Eclectic geometric jewelry for dreamers, thinkers & doers. High quality sterling silver & brass all designed and handmade with care in NYC. ✚ 16% off any order with code ‘D16Holiday’ placed thru Sunday, December 6. ✚ Unique sterling silver jewelry inspired by geometric & architectural elements. Each piece is handmade in San Francisco, using traditional silversmithing methods. ✚ Quilts and personal accessories that are handmade using traditional methods with modern aesthetics. ✚ Free shipping on quilts always and forever – no code needed. ✚ Handmade, unique copper jewelry for everyday livin’. ✚ One of a kind paintings in acrylic, borne of an obsession with mountains and neon pop // teeny herkimer diamond bracelets with sterling silver fixings – also neon (and mood-improving, if you ask me). ✚ 15% off all orders with D16HOLIDAY until 31st December + free UK delivery, always! Thanks so much, Anna. Can’t believe I missed out last year somehow – I was in attendance in ’13 – the years have flown by. ✚ Typography Pillow Covers & Tote Bags and Printable Downloadable Digital Art to make your home sunny, happy & inviting. Thank you Anna for this amazing opportunity! ✚ Currently adding many more items today and tomorrow! ✚ Use code 2MOREDAYS for 30% off your purchase thru Monday 11/30/15! ✚ I make giclee art prints from original abstract and minimalist paper cutouts and mixed media collages. My colorful and joyful illustrations are inspired by the simple but beautiful Scandinavian visual culture. ✚ I do fabric crafts and machine embroidery. I have pouches, purses, dice pouches and dog bandannas. I do the machine embroidery and sewing myself. ✚ There is a 10% coupon code FBLOVE you can use at checkout. Most items ship free to anywhere in the USA. ✚ Inki is a (cartoon 🙂 Fashion-sista whose daily outfit prints as seen on her instagram (theinkigirl) are available by PDF Download Printables. Something, not entirely new, but a bit outside of the norm. ✚ I take photographs on 35mm film, and use them to make cool things fir good people. Clutch bags, purses and stationery mostly! All handmade, good quality stuff. 100% vegan as well, if thats what you like in a handy pouch!! ✚ Hand-made Hamsa with semi precious stones. ✚ Block Printed and metallic patterned linen pillow covers. ✚ Use code WAX15 for 15% off your order. ✚ Gender neutral, small batch, hand poured soy wax candles with nostalgic fragrances and fun branding. Some scents include: Bacon, Fruit Loops, Capn Crunch Berries, Boozy Gingerbread Eggnog, Peppermint & Pine. ✚ Map and typography based illustration and photograph prints. ✚ New York City (mostly) photography. ✚ Boldly patterned, modern textile home decor, handmade by the designer in Los Angeles, California. You’ll find pillows, tea towels, coasters, trivets, napkins, and handmade gifts! ✚ Delicate, modern jewelry. Wire-wrapped and chain/gemstone-based earrings, necklaces, bracelets, and rings. ✚ Save 15% with code “DOOR16” through Dec. 14th. ✚ Handmade Pop Art Stained Glass pieces! ✚ I make totes, zines, comics, books, laser cut wood jewelry, buttons, bobbins, and other bits and bobs. 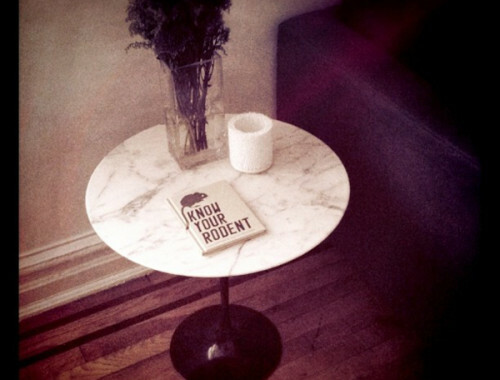 I love Moz, too. ✚ Handmade jewelry exploring my interests in alchemy, feminism, mysticism, cultural re-appropriation and punk rock. ✚ use code MONDAZE30 for 30% off until December 12th. ✚ Independent online boutique featuring modern handmade gifts and accessories. 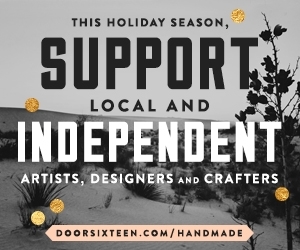 All products are handmade by US independent artists and designers. ✚ 20% off entire purchase now through Dec. 5th, using code DOOR16 at checkout. ✚ Stationery, custom cards and design. Our limited edition 2016 Calendar is now available. ✚ Use code “Holiday15” for 15% off all custom holiday cards until Friday, 12/4. Also, all cards are in my shop are only $1 until they’re all sold out. ✚ We are a small company of two who specialize in small leather goods and knitware! ✚ Use the code DOOR16 to get free shipping until December 31st. Thanks! ✚ We don’t do discount offers or promo codes, as we give you our best price and free (EU) shipping, every day! ✚ Hand painted silk scarves, shawls, ruanas, shrugs; hand made jewelry featuring whimsical to wow! Stop by for a peak, new items will be added daily during the holiday season. Gift wrapping offered at no charge. ✚ Use code DOOR16 for 16% off your purchase!! ✚ Fine hand crafted leather goods from Vancouver, BC. Free shipping within Canada, combined shipping to the US through the Etsy shop (www.loperandhaas.etsy.com). ✚ I make tote bags (and sometimes cloth napkins) from fabulous wax resist African prints. All cotton. ✚ Small art gallery with unique and affordable glicée art prints by international artists. ✚ We are a hair and skin care focused company that delivers all natural, hand crafted apothecary products. We are passionate about men’s grooming and beard care, women’s hair and skin care, and amazing aromatherapy for all. Based in Minneapolis, MN. ✚ Illustrated prints, notebooks, transferrable tattoos, mens & womens clothing and accessories from Cardiff based illustrator Alternative Aesthetics. ✚ DISCOUNT CODE: 10% OFF and FREE delivery use code: facebooklike1125 . Expiry date:December 31, 2015.